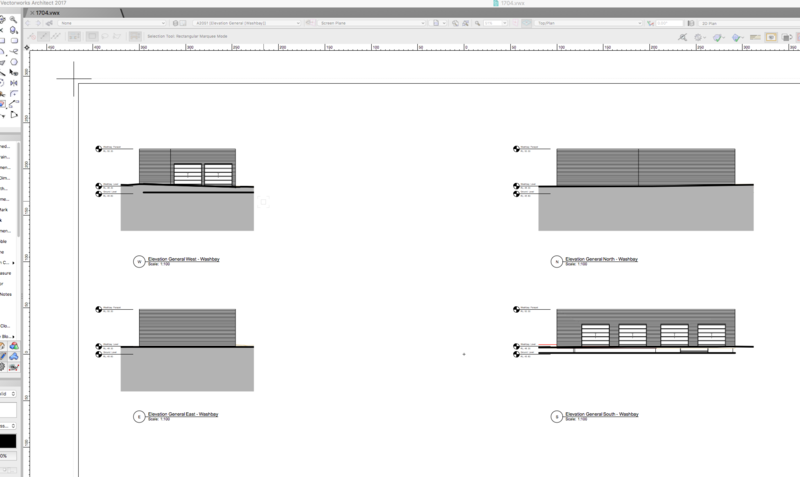 Persistent problem here...sometimes when I create a section viewport from a site model the section component (of the site model) will be 'filled'. Other time it wont be. For no apparent reason! I can't for the life of me figure out what the problem is. Is this a known problem? It changes randomly and without warning. Typically I use: Advanced Section Properties - Attributes - Separate Cross Sections [Attribute Class - Section Style]. You can see in the attached screen grab the South Elevation does not have a fill below. The settings on each of the viewports are identical. The 3D display settings for the model is '3D mesh solid'. As I've invested a lot of time building an accurate site model and assistance will be appreciated. The first thing I would look at is your class and layer visibilities within each VP. Not sure if this applies to these questions, but, . . . The v2018 Site Model Skirt (in some previous versions called the Hull) is not a volume, but rather is a hollow shell (as far as I know). The skirt component is only visible when the VP 3d display is set to one of the Mesh options. The skirt attributes are controlled via Site Model OIP>Site Model Settings>Graphics Properties>3d Sides/Bottom. But, correct me, please if there are options! I think we need to see all the way through the site model to plane(s) where the skirt stops the view. 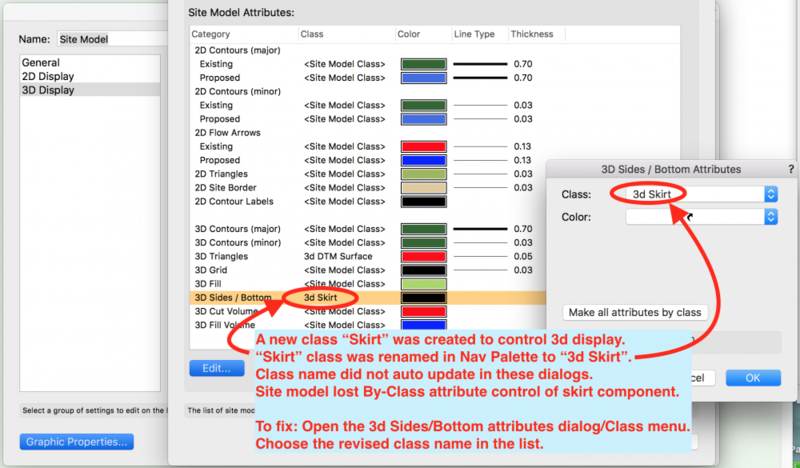 But, I also found that revising (eg in the Class tab of the Navigation Palette) the name of the class assigned to the 3d Sides/Bottom breaks the attribute control of the skirt until manually updated in the Site Model OIP>Site Model Settings>Graphics Properties>3d Sides/Bottom. The class name revision does not auto update in those two dialogs. One more interesting note: this seems to be file dependent. I have one file where the site model is filled in section viewports as expected, and one where it isn't. So far as I can tell right now, they have the same settings. I'm having this problems with VW 2019, any resolution? Yeah I'm having this issue - in the same file, with the same site model, but two different sections. The model file and section viewports were originally created in VW Landmark 2014, and all the sections were filled. I've just opened with 2019 and one section is now hollow... I'm checking the class sections etc but nothing has changed since I last opened the file? I can't see what's changed specifically to one viewport! A weird one. Weird indeed. Let us know how to resolve it. In past versions, sometimes just changing a class attribute, then changing it back, resets the visibility issues. Other times same process requires exit the dialog or a save, then change it back. And, then, the old Update Site Model needs a click. But vwx may have evolved past those easy, but undocumented fixes. Yes, there is no way to make a solid fill of a DTM in 2019, doing it manually is a pain in the neck.